Chehalis is located in and the county seat of Lewis County, Washington. It is a small town of approximately 7,000 residents. 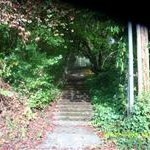 The Steps in Chehalis, Washington are purportedly located in a residential area behind the Chehalis Library. 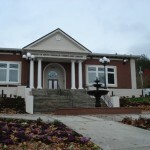 Driving up Park Street to the stop sign near the Chehalis Library, follow the driveway nearby that leads to an alley. The Steps are located at the end of this driveway. The Chehalis Steps consists of three flights of stairs with a winding pathway between landings. Some people report that The Steps once lead up to a school in Chehalis that later burnt to the ground. Other people claim that no school existed at the top of these stairs, but rather the stairs were built to help people get up and down the hill behind the Chehalis Library. According to local lore, “The Steps” in Chehalis, Washington are the foundation of a building that was burned to the ground. The building, according to locals, was a schoolhouse and it burned down with the children still inside. One resource claims that the schoolhouse did indeed burn down, but during the summer months when school was not in session. This source makes the claim that no one died in the fire, however, the janitor at the school discovered the burning school. He did not, however, light the fire. Today, folks claim to see the apparition of a young boy playing with a wagon near these steps. >> View ALL Haunted Misc.